Submitted by via Cornwall Co... on Wed, 05/09/2018 - 12:12. 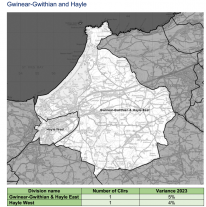 Council retain the entire parish of Gwinear-Gwithian in one division. the current option was preferred.